Four Seasons Aberdeen Florists know that it is essential to be able to offer all of our customers a great range of items which are fit for any occasion, and this is why we have specifically created this section of our website for our customers to browse the wonderful range of balloon bouquets which we have available. Balloon bouquets make a wonderful gift to celebrate a happy time such as a birthday or the arrival or a new baby, and are also perfect to send good wishes to someone. Four Seasons flowers are delighted to be able to offer our customers a fantastic range of different balloon bouquets suitable for a range of occasions. 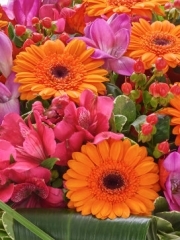 The florists in Aberdeen have over 40 years of experience in the floristry industry, and so take a great deal of pride in their work and are dedicated to maintaining high standards in all of their products. This means that choosing to order a balloon bouquet from us today is a sure way to purchase something of great quality. The team at Four Seasons believe that customer satisfaction is of the utmost importance, which is why will carefully oversee your order with us until it has been safely delivered to you. Please do not hesitate to get in contact with us should you have any requests or queries concerning your order, as our team would be delighted to help you in any way possible. We are sure that you will be able to find something from this collection which will suit your tastes, but if you have any specific requests or ideas then our florists would be delighted to hear from you and discuss different options. A balloon bouquet is a wonderful gift idea and our team are ready to help you find whatever it is that you might be looking for. Choose Four Seasons Florists today for a balloon bouquet and you won’t be disappointed. Additionally to providing fantastic balloon bouquets which are bound to bring joy, Four Seasons flowers also offer a range of delivery services for our customers to choose from. Flowers Four Seasons believes that it is essential that all of our customers are able to have their flowers delivered to them at a time and date which is suitable. The Aberdeen flower delivery service operates six days a week throughout Aberdeen and the local area, providing a reliable and efficient service. It is easy for you to choose a day of the week, from Monday to Saturday, for your delivery to take place. It is also possible for you to request a time slot for the delivery, either morning or afternoon. The team at Florists Four Seasons also offer a same day flower delivery service for our customers, which ensures that your special balloon bouquet will be delivered to you on the very same day as you ordered it. However, it is necessary that your order is placed with us before 3pm on the day in question for same day delivery, so the florists in Aberdeen have the time that they need to create your order with skill and care. 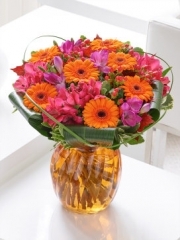 Four Seasons Flowers is also a member of the Interflora brand, which means that we can offer our customers a range of delivery services further afield should you so require. By ordering with us at Aberdeen Four Seasons, your balloon bouquet can be delivered to a huge range of locations across the United Kingdom and even abroad, as we are linked with international flower delivery services in 140 different countries across the world. 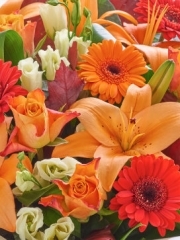 Four Seasons Florists is a great choice for an unforgettable gift.